Israeli troops killed a son of Gaza's most powerful leader along with 18 other Palestinians on Tuesday in the bloodiest day of fighting in the coastal area since Hamas militants seized control last summer. As fighting raged in Gaza, a Hamas sniper shot and killed an Ecuadorean volunteer working in the potato fields of an Israeli border farm. That killing, and Tuesday's high death toll, stoked the flames of violence at a time when Israel and Palestinian moderates are making halting attempts to talk peace. Tuesday's bloodshed began before dawn when Israeli infantry, tanks and helicopters pushed into northern Gaza in what the military said was a routine operation aimed at Palestinian militants who launch rocket barrages at Israeli towns near Gaza almost every day. Three Palestinian civilians were killed in the ensuing fighting, along with 14 armed militants - one of them Hussam Zahar, 24, the son of hard-line Hamas leader Mahmoud Zahar. The Israelis pulled out Tuesday with no casualties. A later airstrike on militants firing rockets into Israel killed two more Hamas men. At the morgue at Shifa Hospital in Gaza City, a weeping Mahmoud Zahar held his lifeless son's bloodied head in his hands and closed his eyes, then kissed him three times on the forehead and recited verses from the Muslim holy book, the Quran. Zahar is widely seen as the most powerful Hamas official in Gaza and is thought to have masterminded the group's violent takeover of Gaza in June. Another of his sons was killed in 2003, when an Israeli F-16 dropped a bomb on his house in a failed attempt on the Hamas leader's life. Zahar has two surviving sons and four daughters. 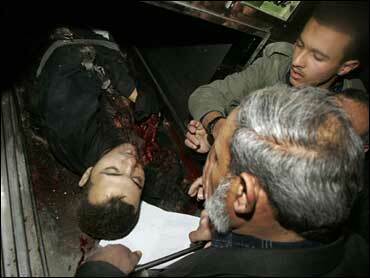 Hussam Zahar was not targeted by the Israelis, Israeli Deputy Defense Minister Matan Vilnai said. Hamas, Mahmoud Zahar vowed, will respond to Tuesday's raid "in the appropriate way. We will defend ourselves by all means." Not long afterward, a Palestinian rocket slammed into the southern Israeli town of Ashkelon, not a regular target for militants. The southern outskirts of the city of 120,000 people lie about six miles from Gaza. Most Palestinian rockets land much closer to the Gaza border. Several Palestinian factions, including one allied with Hamas, claimed to have fired the rocket. Hamas said it fired a barrage of rockets at Sderot, the first time in months the group has targeted the Israeli town. Israeli rescue services said five people were slightly injured by shrapnel and power supplies were cut for a while. Hamas also took responsibility for killing Carlos Chavez, 19, of Ecuador. He was volunteering on a kibbutz, or communal farm, near the border when he was shot in the back by a sniper. Chavez was taken to the kibbutz infirmary, where a medical team pronounced him dead, police and the military said. His death underlined why Israel's military operations in Gaza are vital, said Maj. Avital Leibovich, a military spokeswoman. "The shooting of the Ecuadorean youth demonstrates the necessity of the defensive measures the military is carrying out with pinpoint operations," she said. Swaths of Gaza farmland planted with olive trees, cucumbers, tomatoes and squash were destroyed in Tuesday's operation, Palestinians said, and a used car market in Gaza was hit by three tank shells. The three civilians killed included a 65-year-old man, militants and doctors said. Fifty-two people were wounded, among them an 8-year-old boy who was seriously hurt, medical officials said. Shifa Hospital in Gaza City appealed for blood donations because of the large number of wounded. Dr. Moaiya Hassanain of the Gaza Health Ministry said the wounds suggested the Israeli tanks were firing flechette shells, an anti-personnel weapon that throws out thousands of metal darts. The military had no comment on whether such munitions were used. Meanwhile, CBS News correspondent Robert Berger reports Israeli security workers uncovered two tons of fertilizer used to make bombs in a shipment of humanitarian aid to the Gaza Strip. It was the second such seizure in two weeks, and the army accused Hamas of exploiting humanitarian aid for terrorism. Israeli officials say this is why trade has been reduced to a minimum since Hamas seized control of Gaza. The Hamas government called a three-day mourning period and ordered flags on all government buildings to be lowered to half-staff. Israel is holding peace talks with Palestinian President Mahmoud Abbas, who took control of the West Bank after losing Gaza to Hamas. But Israeli forces continue to battle Gaza militants who bombard southern Israel with rockets and mortars and attack troops along the border. Thousands of rockets have hit inside Israel in the past six years, killing 12 Israeli civilians and causing hardship for the 30,000 Israelis who live around Gaza. Hamas' senior political leader, Ismail Haniyeh, denounced Abbas for trying to make peace with Israel. "Shame, shame, for those who shake hands with the leaders of the occupation, those who sit with the occupation leaders, and those who give compromises to the occupation," Haniyeh told Hamas TV. Abbas, Hamas' most bitter rival, denounced the raid and said it undermined peace efforts. A Hamas official said the prime ministers of Qatar, Kuwait and Saudi Arabia called Zahar to express their condolences. In Damascus, Syria, the exiled leader of Hamas said Israel's Gaza raid was the result of President Bush's visit to the Middle East. "This crime is the ugly fruit of Bush's visit to the region. He has incited the Zionists and has exerted pressure on the Palestinian side to become more hardline against Palestinian dialogue," Khaled Mashaal said in an interview in his office with The Associated Press. Mashaal was referring to Abbas, whose mainstream Fatah faction has been locked in a bitter power struggle with his Hamas group that now controls Gaza. "Bush's visit to the region gave the Zionists a green light and this is the practical implementation by the criminal (Israeli Prime Minister Ehud) Olmert in the Gaza strip," Mashaal said. "This proves that our people are great and our leaders sacrifice their sons. These are the real leaders that meld with their people and defend them, not those who infiltrate to the futile negotiating table with the Zionist entity," he said of Fatah. Mashaal said Hamas will retaliate to the Gaza raid with "more resistance, steadfastness and national unity." "We will not offer more concessions because of these crimes," he added.